Illustrations in this ebook appear in vibrant full color on a full color ebook device, and in rich black and white on all other devices. Narnia . . . where animals talk . . . where trees walk . . . where a battle is about to begin. A prince denied his rightful throne gathers an army in a desperate attempt to rid his land of a false king. But in the end, it is a battle of honor between two men alone that will decide the fate of an entire world. 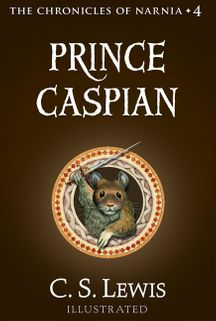 Prince Caspian is the fourth book in C.S. Lewis’s The Chronicles of Narnia, a series that has become part of the canon of classic literature, drawing readers of all ages into a magical land with unforgettable characters for over fifty years. This is a stand-alone novel, but if you would like to see more of Lucy and Edmund’s adventures, read The Voyage of the Dawn Treader, the fifth book in The Chronicles of Narnia.